The stars must have been aligned–this dish was a huge hit at our house tonight. 1. Prepare one pound of dried tortellini pasta according to the package directions. 2. While the pasta is cooking, steam one package of frozen asparagus and then puree. 3. Make Rachael’s béchamel sauce (omit garlic by accident and instead use one part vegetable broth and one part fat-free milk). Add pureed asparagus. 4. 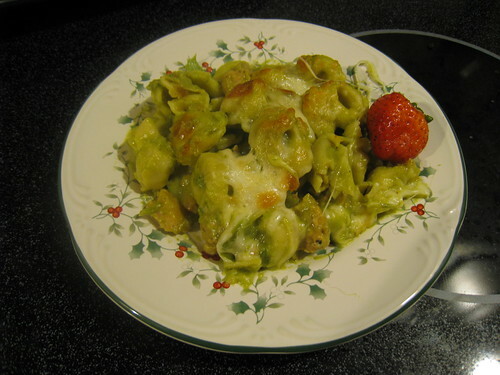 Toss the now very very green sauce with the pasta to coat. 5. Brown a package of tomato/basil chicken sausages (squeezed from their casings and crumbled) and add to the pasta and sauce, stirring gently. 6. Pour into a baking dish and cover with TJ’s Quattro Formaggio (about 1/2 a package). Bake at 375° for about 15 minutes until the cheese is browned and the sauce is bubbly. I6 ate all of what he was served. E3 had two servings. Karl snarfed up a huge bowl. Angels sang. Now it’s back to NaNoWriMo for me. Previous Post NaNoWriMo is killing me. that doesnt bode well for me. I’m glad it was a hit. I’ve only tried a couple of her recipes and they were all disasters. She is now my sworn enemy. Sounds lovely… wonder if there is a way to make it without cheese…. sigh. Oh – you had me at the pureed asparagus. Keeping that one, I am, Grasshoppah. Sounds too delish – and may I add, delighted to see you say “Back to NaNo”……if you’re short of word count, I can send you two wordy hunks of boring rambling by a little Irish semi-pagan priest; I cut him out and saved him aside, only to have him do it AGAIN! So I cut him out again. I know, probably cheating, but as I am wont to say, “It’s easier to get forgiveness than permission”.